http://vacuousminx.wordpress.com/2011/08/03/authorial-intrusion-and-reader-response-my-georgette-heyer-experience/ for examples of the reported offending passages and the changes the current publisher of Heyer’s works has made to those passages). That being said, when I began writing Book 6 of my highly popular and award-winning Realm series, I was most sensitive to the need to portray the Jewish characters in my book with realism. 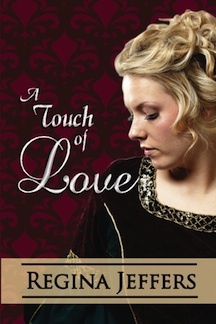 In A TOUCH OF LOVE, the heroine, Lucinda Warren, discovers her late husband had married another before he spoke his vows to her. Captain Warren had hidden his Judaeo-Germanic background, his family having converted from the Ashkenazim sect to the Church of England, but his situation became more complicated when he marries a Sephardic Jew from Portugal during the Peninsular War. A TOUCH OF LOVE speaks to the prejudice within England, upon the Continent, and between these two nations within the Jewish race, as well as speaking of the general prejudice found among the members of the haut ton. So, what was it like to be a Jew during the reign of King George III? In 1760, in imitation of the Deputies appointed to protect the civil rights of Protestant Dissenters, the Spanish and Portuguese Jewish population nominated deputados to oversee political developments of special interest to their well being and to approach the government on the group’s behalf when necessary. A standing committee was also appointed to express homage and devotion to the new sovereign. However, the Ashkenazi faction presented a formal protest, claiming neglect. The Ashkenzami group nominated their own German Secret Committee for Public Affairs to act on their behalfs. The administration refused to deal with two separate groups, saying they would communicate only to the Committee of the Dutch Jews’ Synagogues and the two factions must find a means to communicate. These deputados represented 6000-8000 Jews, the majority of which lived in London. Approximately 25% of the population belonged to the more anglicized Spanish and Portuguese element. The Ashkenazim, though more numerous, were less assimilated and, generally, belonged to a lower social stratum. (For a complete look at Jews During King George III’s Reign, please visit this Google Book, History and Antiquities of the Jews in England). One thing that really struck a chord with me while doing my research for this book was the fact that Jews were permitted their rights to practice their religion, where I, a woman who was born a Pentacost, became a Baptist, practiced Existentialism for many years, and married a Catholic, would not have been given the same opportunity. For example, another plot point in this series can be found in Book 7, A Touch of Honor. In it, John Swenton is an English baron. He falls in love with the daughter of an Irish Catholic baron. To marry, they must first marry in the Church of England in order for their children to be recognized as Lord Swenton’s heirs. Then they can marry in the Catholic church to meet her family’s obligations. There are all types of prejudice in the world. LUCINDA WARREN’s late husband has left her to tend to a child belonging to another woman and has drowned her in multiple scandals. Her only hope to discover the boy’s true parentage and to remove her name from the lips of the ton’s censors is Sir Carter Lowery, a man who causes her body to course with awareness, as if he had etched his name upon her soul. A cruel twist of Fate has thrown them together three times, and Lucinda prays to hold off her cry for completion long enough to deny her heart and to release Sir Carter to his future: A future to which she will never belong. Lucinda had stood on the busy street corner for a quarter hour, attempting to shore up her nerves. She had carefully read the social register for the past few weeks, waiting for the return of the Duke of Thornhill to his London townhouse. A single line of type had reported Brantley Fowler’s presence at Briar House, and Lucinda had wasted no time in sending a note around, requesting an audience with the duke. Thornhill had responded immediately, setting the date and time. Self-consciously, she checked Matthew’s pocket watch for the time. She regularly carried her late husband’s watch in her reticule. It was one of the few items she had kept to mark her days as Matthew Warren’s wife. “Time,” she murmured. Matthew never found the time to speak the truth, Lucinda thought bitterly. As she set her shoulders to cross the street, she wondered how Thornhill would take to her report of his old friend. I have no choice, she assured her rapid pulse. She sidestepped a fresh pile of horse dung while dodging a young gentleman’s poorly driven curricle to step upon the curb before Briar House. It was a magnificent house: plenty of windows to permit the light and warmth of even a weak sun, as well as beautiful columns giving the exterior the look of a Roman theatre. Briar House spoke to the Fowlers’ place in Society. Her breath hitched, and Lucinda chastised herself for the very feminine desire to break into tears again. Her eyes swept the townhouse’s façade. Splendor she would never know. The butler’s eyebrow rose as he peered behind her to look for her maid, but it had been more than a year since Lucinda could afford help of any kind. She pretended not to notice the servant’s disapproval. “This way, Mrs. Warren,” the butler said diplomatically. Lucinda politely followed the man up the stairs and along an elaborately decorated passage. She had attended the Come Out ball for Thornhill’s sister, Lady Eleanor Fowler, and his cousin, Miss Velvet Aldridge. Now, Miss Aldridge was Brantley Fowler’s duchess, and by all accounts the man’s one true love. Yet, on that one evening, Lucinda had received the duke’s attentions, and although she had been a bit uncomfortable with Thornhill’s sudden adoration, the evening remained one of Lucinda’s favorite memories. A man of worth had revered her intelligence and her good sense. A man had found her attractive, something Matthew had never done. The butler tapped on an already open door. “Your Grace. Mrs. Warren to speak to you.” The man stepped aside, and Lucinda entered a very masculine study. Dark wood panels spoke of a strong mind and an unqualified determination, both of which could easily describe the Duke of Thornhill. Brantley Fowler caught Lucinda’s hand and brought it to his lips. “I was pleased to hear from you,” he said easily, “but I admit you have piqued my interest.” Lucinda had always liked the young lord. The future duke had spent but two months in the same company as had Lucinda’s late husband; and during the brief interval, Fowler and Matthew had renewed their university friendship. She was proud to say the young lord had always treated her with respect. She was the daughter of the second son of an earl, and the future duke accepted her as his equal socially. In fact, once when Matthew had found fault with the meal she had managed on the few supplies available, it had been Brantley Fowler who had taken up her defense. The duke frowned. “I would hope you would view me as an ally, Lucinda.” His ready familiarity eased her tension. “As you wish, Your Grace.” The butler closed the door upon his exit. Lucinda had always prided herself on her frankness. She had come to beg Thornhill for his support, and the duke deserved the truth, as she knew it. “I am, Your Grace,” she said more calmly than she felt. She cleared her throat and hoped her voice did not betray the chaos rushing through her veins. “My mother passed some five months after my marriage to Matthew. The Colonel lost his life in Belgium.” She could not hide the grief, which tugged heavily at her heart. Losing her father had come close to sending her over the edge, both figuratively and literally. “I would prefer not to seek the assistance of the Earl of Charleton. The Colonel and Uncle William were often at odds. I would not wish to claim the role of poor dependent.” Lucinda did not think her father’s oldest brother would take kindly to the situation in which she now found herself. “And the Warrens?” the duke prompted. His words caused her heart to stutter. Every time she thought of Matthew’s betrayal she wanted to curse the heavens. The duke’s mouth formed a thin line of disapproval. “I had once thought Matthew’s parents perfect in every way,” he confessed. “Was there no identification?” Thornhill inquired earnestly. Lucinda set her shoulders in a stiff slant. She dreaded what was to come, but the duke would accept nothing less than the absolute facts. “Only a note pinned to the child’s jacket.” When the duke did not respond, she continued. “The note announced the child to be Matthew’s. By his wife, a woman he had married in ’09, some two years before he returned to Devon for the pronouncing of our vows.” Lucinda kept part of the truth as her own special torment. She did not tell him the complete facts of the child’s mother, that the woman was a Jewess. Lucinda had asked herself that very question repeatedly. “I would hope the Warrens did not knowingly foist a sham of a marriage upon me.” She forced the tremble from her words. Lucinda said softly, “The boy was conceived after our joining.” She would not permit the duke to observe how the thought of her husband with another woman had ripped her heart from her chest; yet, she had cried her last tear for the soul of a dishonest man. Lucinda glanced to the sun streaming through one of the windows. There was only one small window in her rooms, and she sorely missed the air upon her countenance. Too many years of following drum, she thought. “Today, young Simon is with my landlady. The child is staying with me.” Again, she withheld an important fact that would likely color everything with a black stroke. This entry was posted in British history, Church of England, excerpt, George IV, Georgian Era, gothic and paranormal, Great Britain, heroines, historical fiction, Living in the Regency, marriage, military, Napoleonic Wars, political stance, real life tales, Realm series, Regency era, Regency personalities, Regency romance, religion, romance and tagged A Touch of Love, Battle of Waterloo, Georgian England, historical fiction, Jews in King George's England, Napoleonic War, prejudice, Realm Series, religion, Romantic Suspense. Bookmark the permalink. Was it george Eliot that included the Jewish populace in many of her novels? I haven’t read or watched anything related in a while but some of the British movie productions are stunning. Regina, I will certainly have to pick up a copy of this book as soon as may be. Do I need to start with Book One to understand it? On a related topic, Jane Austen herself displayed anti-Semitic tendencies. Recall John Thorpe in Northanger Abbey referring to Mr. Allen as “rich as a Jew.” This was replaced in the 2007 film by “rich as Croesus,” but has always bothered me. It probably should not, reflecting as it does the basic British worldview of Jewish people that continues to this day … and, I’m sorry to say, is proportionally represented in the JAFF community. Lucinda Warren makes her first appearance in Book 2 of the series, but you could read A Touch of Love without reading the whole series, although you are welcome to do so. There is more overlap between books 1 and 2 because a writer never knows when a reader picks up a series. I have read countless book twos before book one. There is a list of characters at the beginning of the book to help you keep the main cast straight in your mind. There are seven members of the Realm. Carter Lowery is the youngest of the group. He is a second son and joined the Home Office as an agent. He will eventually take over for Aristotle Pennington, the main the group calls “Shepherd” because he shepherds them from one assignment to the next. Re: Anti- Semitic tendencies of Austen– John Thorpe doesn’t say or do anything in a proper manner. He is a character who lies and isn’t at all admirable. As far as someone like John Thorpe was concerned the only Jews he would know of or might encounter would be money lenders many of whom were rich.